Elgin Sweeper, the leading manufacturer of street sweepers for general street maintenance, special industrial and airport applications, today announced it has entered into a marketing agreement with Challenger Manufacturing Ltd. to market and distribute a mechanical broom sweeper under the Elgin Sweeper brand name in North America. The Elgin Broom BadgerTM dual-engine sweeper, mounted on an Isuzu NRR 19,500 lb. Class 5 cabover chassis, is easy to operate and maintain and does not require a commercial driver's license (CDL) to operate. "This agreement allows Elgin Sweeper to further extend our street sweeper product offering in North America and provide our municipal and contractor customers with more options to meet their sweeping needs," said Brian Giles, sweeper products manager, Elgin Sweeper. "We are excited about taking this next step to grow our North American market presence with Elgin Sweeper and through their unmatched dealer support network," said Mirek Byczynksi, president of Challenger. The compact, low-profile design of the sweeper allows easy access to tree-lined streets. 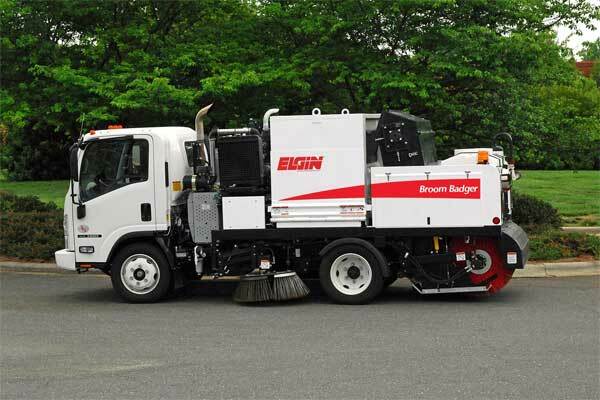 Highly maneuverable, the Elgin Broom Badger has a short, 109-inch wheelbase and a tight turning radius for cul-de-sac curb lines and narrow, winding streets. Featuring a 4.15-cubic-yard variable to 10 feet, side-dump hopper, and variable displacement, load sense piston pump-type hydraulics, the Broom Badger offers an optional air ride suspension and can travel at highway speeds, allowing the operator to quickly get from one job site to another. The efficient sweeping system on the Broom Badger sweeper is powered by an auxiliary Tier 4i Kubota 59-horsepower diesel engine. "This economical, compact sweeper is ideal for our municipal and contractor customers who need powerful cleaning without a full-size sweeper," Giles said. "The Broom Badger offers the same efficient cleaning system as our larger models, but is suitable for smaller sweeping applications." The cabover design of the Elgin Broom Badger sweeper provides unmatched visibility and safer operation. Spot mirrors and low-cut windows provide the operator with precise gutter broom viewing. A standard dual-camera and 7-inch color monitor system provides views to the side broom or rear view. The ergonomically designed control console provides easy, comfortable operation. The sweeper features dual gutter brooms with up to a 120-inch sweep path. The direct drive brooms feature in-cab control for down pressure and tilt angle. Four solid broom arms provide increased longevity. Featuring a direct drive squeegee-type elevator design to handle heavy-duty sweeping applications, the 58.5-inch wide elevator on the Broom Badger sweeper eliminates the need for curtains and provides increased productivity. The hinged plate allows for easy cleaning and inspection. The sweeper is equipped with a 220-gallon water tank for dust suppression. The side-dumping, 4.15-cubic-yard debris hopper allows extended sweeping intervals for increased productivity on the job. A private, Canadian-owned company, Challenger Manufacturing Ltd. has been producing sweepers for six years, with hundreds of road sweepers being sold and operated throughout North America. With nearly 100 years of experience, Elgin Sweeper offers municipalities, contractors and industries the most sweeper options in the country, using the latest sweeping technologies, including alternative fuel, mechanical, pure vacuum, regenerative air and waterless dust control. For more information on the Broom Badger mechanical sweeper from Elgin Sweeper, please contact your local Elgin Sweeper dealer, or visit www.elginsweeper.com to find a dealer near you.